Looking for a beautiful nautical 5th anniversary, Valentines Day, Engagement, Bridal shower, Wedding, Christmas gift or any other special occasion? This beautifully crafted and engraved serving board is crafted by us from bamboo, and engraved with and anchor among an infinity symbol. Let us add your initials in the middle of the infinity symbol or we can custom personalize it as per your request anywhere on the board. 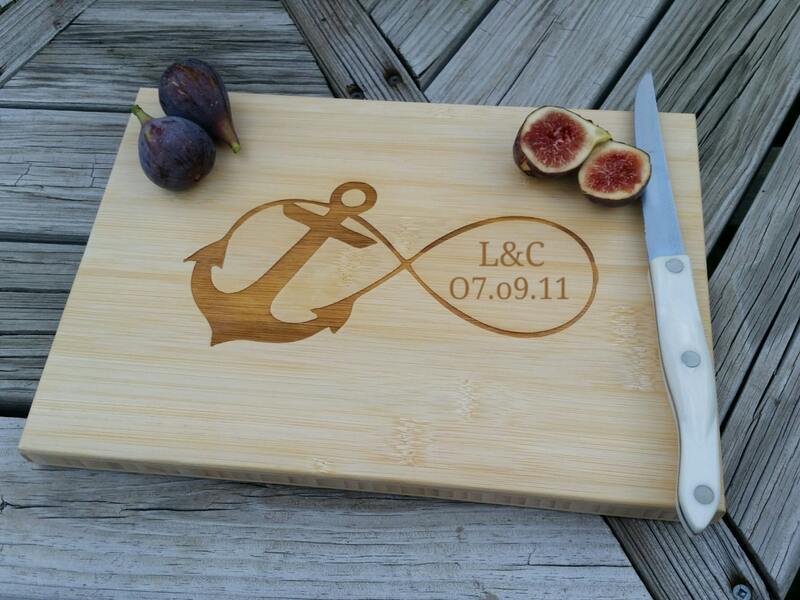 Our beautifully crafted and engraved cutting board is crafted by us from bamboo. We do not sell pre-made cutting boards. All edges are routed for smooth edges and a natural finish is added to each and every board on both sides. The finish is cured overnight. Our boards are two sided: One side can be used as a decoration in the kitchen, while the other (blank) side can be used as a traditional cutting board. This way, both sides are functional in their own way. Want a Different board size? Since each board is made by us from scratch we can make them any size you would like.